Yesterday it was reported that a long email chain was uncovered that provides evidence that former FBI Head James Comey and others in his inner circle signed and sent a FISA warrant application to the FISA Court and that they knew the FISA warrant was fraudulent. 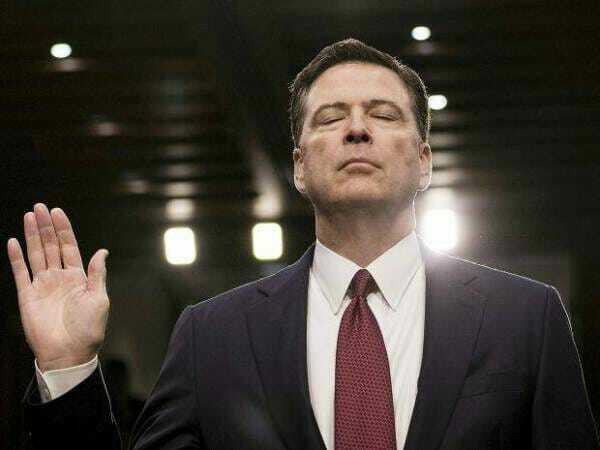 Since the emails are labeled classified by the Deep State DOJ and FBI, Comey wanted to have his testimony in front of Congress this week in the open so he wouldn’t have to discuss his criminal actions like this one. Yesterday, John Solomon from the Hill reported that a long email chain was uncovered that the Republican House members added to the list of documents they would like President Trump to un-classify and release to the American public. “If these documents are released, the American public will have clear and convincing evidence to see the FISA warrant that escalated the Russia probe just before Election Day was flawed and the judges (were) misled,” one knowledgeable source told John Solomon. The FBI acknowledged in the emails there were intelligence community concerns about the Steele dossier before they secured a FISA warrant. The FBI knew Steele was talking to the media before they obtained a FISA warrant. This is significant because the FBI has maintained for the last two years that they fired Christopher Steele after they obtained the FISA warrant after finding out he violated FBI protocol by speaking to the media. The FBI used Michael Isikoff’s Yahoo News article as a source to corroborate the Steele dossier when presenting evidence to the FISC. If they knew Steele was Isikoff’s source, the FBI is guilty of circular intelligence reporting which of course is against protocol. They presented the two sources as independent which means they defrauded the FISC. When Comey signed off on the FISA warrant request to the FISA Court to obtain a legal basis to spy on Carter Page and President Trump he lied. We also know from the work of Judicial Watch that no hearings were held on the fraudulent FISA warrant applications sent to the FISA Court by Obama’s corrupt FBI and DOJ leadership team to spy on candidate and then President Trump. No wonder President Trump called Comey the “WORST FBI Director in history”. Although history may rate Robert Mueller the worst FBI Director in history, Comey is certainly a close second and should be in jail. Nothing Comey says should be considered the truth. The post It’s Official: Now There Is Proof Corrupt and Fired Former FBI Director James Comey Lied to the FISA Court to Spy on Candidate Trump appeared first on The Gateway Pundit.